Monkeys in glass tubes and rats on rolling rods are not the answer for early diagnosis of Parkinson’s disease in people. World Parkinson’s Day (April 11th) aims to raise awareness of Parkinson’s disease and the desperate need for effective new treatments. However, many people may not be aware of how animals suffer in labs, used for research into Parkinson’s disease, when the answers we need may lie with patient-centred research and not animal testing. For people, muscle tremors, or loss of fine control of movement, may be the first outward sign of Parkinson’s disease, but these motor symptoms are not the start. The death of dopamine-producing neurons in the brain ultimately cause the tremors, but the damage starts long before the tremors are apparent. Modelling this gradual loss of neurons is not possible in animals. Simulation of Parkinson’s disease in animals often uses injections of toxins directly into the brain. This destroys the dopamine-producing neurons, but the effects are instant and short-lived, compared to the slow progressive decline that occurs over decades in people. Research using animals focuses on inducing brain damage to generate Parkinson’s disease-like tremors, to test whether experimental drugs can reverse these. 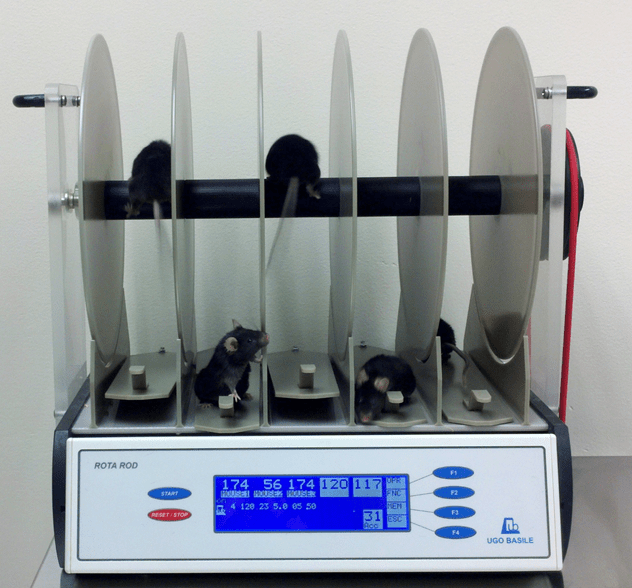 Once the animal shows signs of brain damage, they are made to undergo various behavioural tests, including the hourglass test, the rotarod and the catalepsy test, to see if the drugs alter their ability to respond. The images show a healthy marmoset put through the hourglass test; this times how long it takes the animal to return to upright after being turned upside down. Animals with brain damage may not be able to turn over at all. In the hourglass test, a marmoset is placed in a clear cylinder just big enough to sit up in. The cylinder is then rapidly flipped over, tipping the marmoset upside down. For a healthy marmoset, time to self-right is around two seconds. However, for those marmoset ‘models’ of Parkinson’s disease, where animals are brain damaged or genetically altered, the time increases, with some animals unable to turn themselves upright at all. The rotarod is a smooth, spinning rod. Rats or mice are put on the rod and the time that they can manage to balance as it spins is noted. When the animals fall off, they are picked up, and unceremoniously replaced on the rod. These tests can go on for up to 15 minutes, and as the test exploits the natural fear of falling, this must feel like a long time to a mouse, clinging on for dear life. Again, in this test, healthy animals are compared to those who have had brain damage induced to ‘model’ Parkinson’s Disease. This is the catalepsy test. The catalepsy test involves placing an animal in an ‘unusual’ position and timing how long it takes the animal to move out of that posture. For mice and rats, their front paws are placed on a bar so that they are in a semi-upright sitting position. Superficially, this can look quite cute, like the animal is standing at the front of class, about to give a lecture, until you realise that the mouse is not moving because his brain has been damaged, either chemically or genetically, in an attempt to give him Parkinson’s disease-like symptoms. Really not cute and instead, rather disturbing. No significant new drugs to treat Parkinson’s disease have been developed over the last 50 years, so it seems that these forms of animal research are failing. Instead, early diagnosis of people is the key to ensuring that promising new cell-based therapies can have full effect. Current treatment options for people with Parkinson’s disease aim to restore dopamine production in the brain, but future strategies are looking to actually repair the brain by replacing the dopamine producing cells. Several exciting ongoing clinical trials, using people with Parkinson’s disease, are exploring these possibilities. The real issue is how to get an accurate early diagnosis, so that treatment can begin even before the characteristic tremor denoting Parkinson’s disease is observed. Many human-based efforts are designed (and hopefully destined) to facilitate early diagnosis of Parkinson’s disease. Technologies such as magnetic resonance imaging, or MRI, provide detailed, non-invasive images of the brain that can help to reveal the changes associated with the disease and to guide therapies aimed at stimulating specific regions of the brain. A study of the non-motor symptoms of the disease has revealed several symptoms that associate with early Parkinson’s disease and that may be useful in diagnosing the condition before the damage becomes too great. Also, a reduced sense of smell (hyposmia) is associated with dopamine transporter deficiency in people with the disease and has been used to diagnose early Parkinson’s disease. Additionally, PREDICT-PD was a recent study in the UK which employed an online keyboard-tapping task to identify those at risk of the disease before any motor symptoms appeared. In the future, this human, and humane, approach will best address the problem of how to diagnose Parkinson’s disease before the symptoms appear. Past data from human studies, and the wealth of results likely to arise from the current and ongoing trials using people, make further research on animals redundant. Ultimately, there are faster and more cost-effective ways of identifying the people most at risk and reducing their chances of developing this debilitating condition, than putting a marmoset in a tube and turning her upside down. This testing should be banned immediately. This treatment is insanely inhumane and barbaric! This is 2017 people, we don’t need to do animal testing anymore! I’m 100% against it! Surely in this age of technological advancement these barbaric and ineffective tests should now be confined to the past. Leave the animals alone! Stop animal testing now! Animal models don’t even work on people. They’re just ruining these animals for nothing. There is enough inhumane treatment of animals in this world . Please stop! Animals have feelings too. They feel pain too there is no need of this, it should stop, but we ALL KNOW IT NEVER WILL it is human nature to be cruel and mean. How sick is this. Whoever these companies are, they need to be shut down. It’s not just unacceptable but barbaric. Period. How any human being can do this to another sentient being is despicable. There are NO REASONABLE OR LOGICAL PURPOSES to test on any animal ever. A terribly horrific thing to do to any animal. It must be declared illegal.